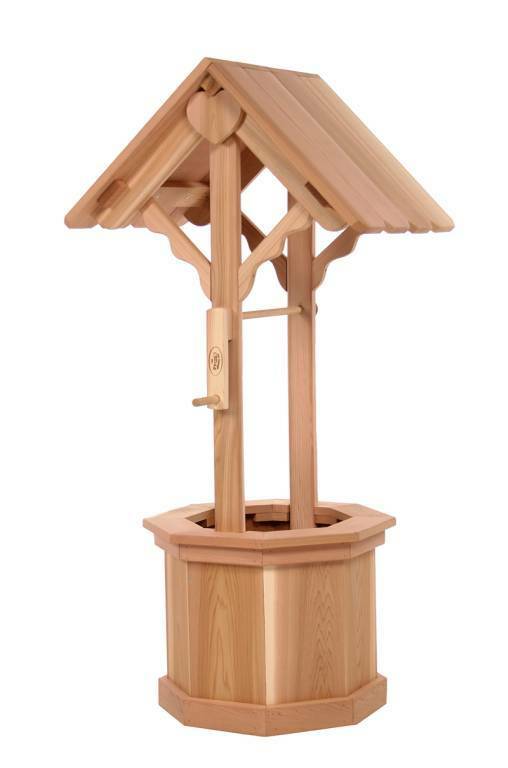 This Small Wooden Wishing Well is a smaller version of the Large Wishing Well and is made using clear Western Red Cedar, giving it a distinct advantage over the elements of nature (whether finished or left unfinished). 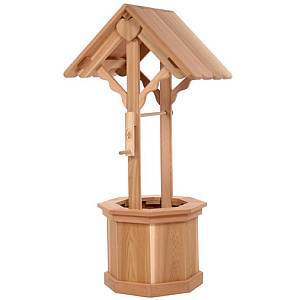 The Cedar Wishing Well makes a decorative addition to any backyard or garden area and offers a convenient solution for covering unsightly water pipes or unattractive areas in your yard. Each Wishing Well comes with a fully functional crank and handle and has plenty of tub space for your bedding plants and hanging baskets. The barrel of the Wishing Well stands 15 inches tall. Each Small Wishing Well has an overall height of 48 inches. This kit comes unassembled only and has illustrated instructions to make assembling your wishing well easy. It comes complete with a beautiful wooden heart to mount on it. What a great idea for a wedding or anniversary gift!